ever sport climbing competition. Quite clearly, La Sportiva was there. The Fiat 242’s diesel tank is full and it is parked in the company’s forecourt of the building at Tesero, ready to leave. Bardonecchia is far away, on the opposite side of the Alpine arc and looking at the map, trying to understand where the watershed dividing Italy and France is, Valle Stretta seems beyond the border. Ah, France! The French seem to have invented high-level climbing, they have Verdon, Buoux, Patrick Edlinger and Patrick Berhault, the EB climbing shoes and even Mont Blanc. They have the magazine Vertical. The difficulties of the routes are measured in French grades and the sixth, seventh and eighth grade no longer exist. They are now graded 6c, 7b, 8a. The French are French, they are strong. But we have the Dolomites. And Manolo. As well as purple and yellow Mariacher climbing shoes. 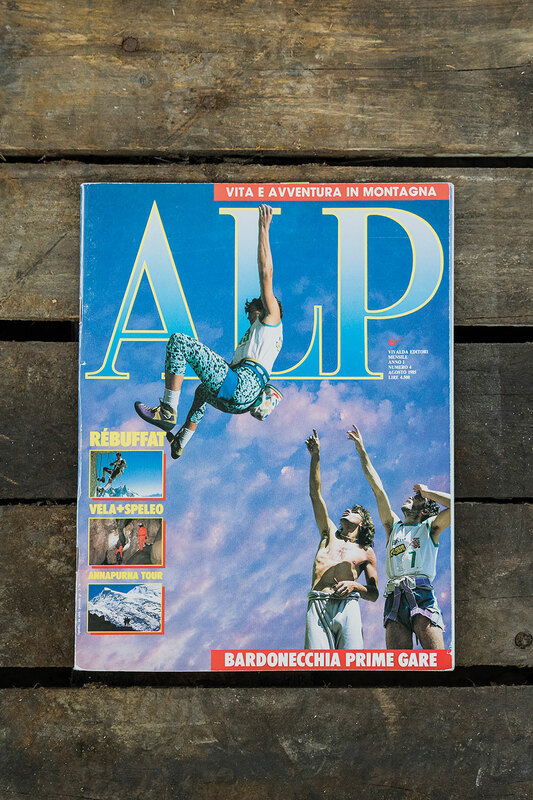 The magazine Alp has just been published, climbing is exploding in Arco and Finale Ligure, at Sperlonga, everywhere in Italy, and then at the end of the day half of Mont Blanc is even ours. We only suffer from a slight inferiority complex, but the first climbing competitions in the Western world will be held in Italy, in a few days' time. Sportroccia 1985. The La Sportiva shoes are better than the EB shoes. Bardonecchia is near France, but it is in Italy. My name is Lorenzo Delladio, I am just over twenty years old and I have a passion for rallies and motor racing. And then of course, I like alpinism, skiing and being in the mountains, I have just finished my military service at the Police’s Alpine Training Centre of Moena. I am the son of Francesco, the owner of the La Sportiva shoe factory, I try to spend as much time as possible with him since he is teaching me the products. We make mountain boots, and our leading product at the moment are revolutionary climbing shoes. At work I follow my father everywhere like a shadow, always by his side, well, half a step behind him, as it should be in fact. I believe he did the same with my grandfather Narciso, the founder of the company, which was established ninety years ago, in 1928 in Val di Fiemme. Most of all, I listen. I look around. I try to learn and understand what is said to me quickly and when someone asks me a question, when my father asks me something, I try to be ready, attentive. I try and make an effort. I try to be efficient, quick, alert. In a few days Sportroccia will take place in Bardonecchia, the first sport climbing competition ever and I have proposed to my dad that I would like to be there and represent our company. He said yes, you should go. I’ll be there. We will be there, the La Sportiva footwear factory will be there. We will offer assistance to the athletes during the competition and we will support them to the best of our abilities with our products and our climbing shoes. The future of climbing and the future of our company passes through here, by the Valle Stretta and by Sportroccia. We must be there. 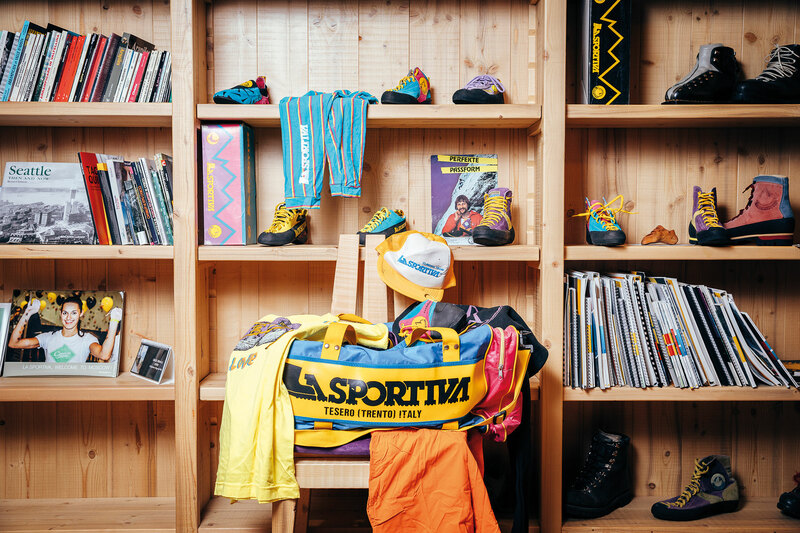 I wander around the company’s basement dragging a big blue and fuchsia coloured bag behind me, with La Sportiva written on it, I walk around a bit disorientated amongst the shelves and I don’t really know what to take with me. I’ve already put new model shoes and prototypes, prepared for our top athletes inside the van. When my father and I talked about it, everything seemed so easy and logical, but now? We have decided to give our competing athletes a support system which is similar to the one I receive when I take part in rally racing: a race service, that’s what we thought. There is not much support I can give them, I realise now, in that warehouse. What else could I bring with me, as well as shoes? I stick an endless amount of spare shoelaces into the bag–does a climbing shoe lace ever break? Probably not. I bring some spare soles and stick them into the bag even if I know perfectly well that those too will never be needed. To change a sole or a shoe far from our lab is something we’ve never done before. But maybe, who knows we will do so in the future. Among those shelves, in that moment, trying to fill up that big bag, I focus on the real reason I need to be in Bardonecchia at all costs: it means representing the company and my family, to talk to the athletes. To meet them. To get to know them and let them get to know us. To show our face, we have to be there. We have to understand what our athletes in order to progress and to manage to climb increasingly better, on increasingly difficult routes, we have to approach the best athletes around. Contact them, become friends, help them discover and try our shoes. Make sure they use and promote them. We have to understand what the shoes of the future will be like and I have to do what my father and grandfather before me have always done: listen to the experts, the best ones, and transform their advice and their ideas into new products and into new solutions. At La Sportiva things have always worked that way, starting from shoes developed for alpinists which originated from shoes for woodsmen made by my grandfather Narciso, and that is why our shoe factory is called La Sportiva shoe factory: to set us apart from all the others who made shoes for working in the woods. We make shoes for alpinism , for climbing and for the people who go to the mountains. Now I know what to put in the bag: I will bring files, sand paper with different sized grains, rags and solvents with which to clean, grease and warm up the climbing shoe’s soles, so the athletes can compete to the maximum of their efficiency. Service the athletes, collect information and make myself known. Show that La Sportiva is present and makes climbing shoes for the best climbers in the world. That is what I am going to do over there.